In the 4th of this 5 part series, I want to point out three additional items that brought me to the obsessive idiot I am today. Most of the guys out there - the real ones that didn't play with dolls - had Matchbox cars as a kid. I understand some of those old cars may actually be worth something today, but as a kid I didn't care. I loved racing them around the shag-pile carpet and up the wood-paneled walls of my little house in upstate New York. I made all the noises and added the crashing sound effects, too. 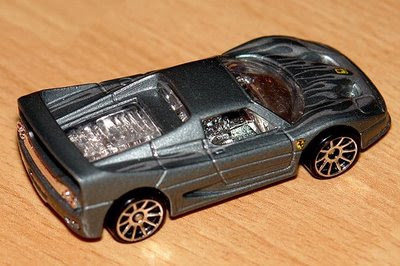 At one point, I had a car much like the Ferrari F50 in the picture, but I accidentally stepped on it. At first I was crushed (no pun intended), but then I realized it was even cooler now that it was flatter. Aerodynamics, baby! Do NOT Speed on 684! Mom had a lead foot. Mom had a Chevy Impala. Mom drove fast. After I got my license, I figured out that certain cars had an extra little umph when you stepped on them. This was that car. A big ol' 8-cylinder engine is a dangerous thing in the hands of an 18 year old. We had a road that ran between Poughkeepsie and Connecticut called Highway 684. It was notorious for cops. There were speed traps every 5 miles or so. Being the clever kid I was, I figured out where all the traps were and found out that if I timed it just right, I could drive really fast without getting caught. Well, I passed the cut off and gunned the engine. I watched that needle slide to the right. 110. 120. 130. I passed a mile marker and checked my watch. When I passed the next mile marker only 26 seconds had elapsed. The speedometer said I was doing 140. Off the gas and feather the brakes. Down to a more respectable 55. Check the mirror. No cops. Whew. I can still hear the voice of Ricardo Montelban on the commercial for the Plymouth Volare. Dad got a deal on it from his buddy, Bob. It had 4-on-the-floor and it was much cooler then the green station wagon (or the Volkswagon bus that I can barely remember). One day Dad says to me, "Wanna see a power shift?" Before I could ask what that was, Dad punches the gas and starts flying through the gears. He had this intense look of concentration. I was about 13 years old and just giggling from the passenger's seat. After we slowed down, Dad explained that he used to race an old TR3 when he lived in Kerhonkson. I knew it! Dad was a racer. Next up - the final installment. 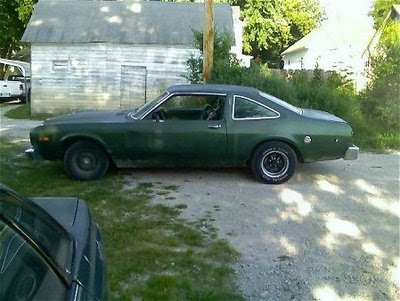 My first car was 1974 Chevy Monte Carlo. It was maroon with a white Landau top. I had the same rally wheels that your mom's impala had, and I even chromed the V-8 engine. I got it when I was 15. A year before I could drive. It was smashed by the time I was 17 and I graduated up to an oldsmobile cutlass '73 I think) that was the same color of your volare'. It was an automatic and me and my mechanic buddy put a shift kit in. We used it as a tackling dummy after football practice. Oh man, what good memories! Thanks for stirrig them back! Oh, and I almost forgot. Corgie Juniors were my play car of choice!! Hot Wheels, Hot Wheels, Hot Wheels! Had 426 of them at one point. (Yes I kept count) Other kids had the tracks with loops and ramps and crap. I'm sure that was cool for them. I on the other hand, couldn't wait to grab two of the cars, go lay on the floor and race them side by side and just lose myself in the fun that I was having. I'm with Riggs. Thanks for bringing a few great memories back, for the old squash to mull over. You learned how to drive a stick shift on that Volare. And every time dad would tell us to get in the car cause we were going for a ride, we would be thrilled! Until dad said "Dr. Chako is driving!" then we would cry "NOOOO WE'RE ALL GONNA DIE!!!" 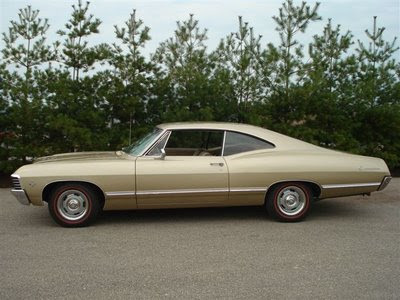 And as for mom's Chevy Impala...whooo weee!!! I remember sitting in the back seat with mom driving that car (no seat belts) and every time mom would round a corner, I would slide from the side I was sitting on clear over to the other side of that car. Sometimes I'd even hit the side and bounce off on purpose. Loved that car and LOVED mom's driving!! Growing up in Ardsley, I drove 684 hundreds of times on my way from the family homestead to either our house in the Berkshires or to school in Boston, oftentimes in the dead of night when traffic was light. My usual ride back then was a 1983 Subaru station wagon that would eek its way into triple digits if the road was flat, but the best, and fastest times were behind the wheel of my mother's various Audis and Acuras (two Audi 5000s and two Acura Legends - Mom went through a lot of cars). Those rides were easily capable of triple digit speeds, and exploited the chances to fly up that big highway whenever possible.